Earlier this year, construction started on new military parade grounds in Manzini, initiated by the Ministry of Economic Planning and Development, Swaziland Government. 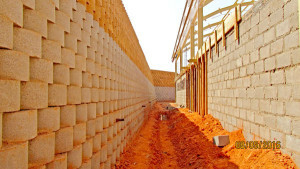 As Terraforce walls construction proceeded on an ablution block at the foot of the grounds, it became necessary to retain the cut slopes between the building and existing access road above. Initially a geo-textile solution was specified, which fell through due to lack of space. 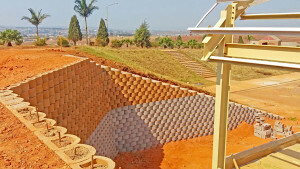 The client, parastatal Millennium Projects, then approached EFS Construction, Terraforce block licensee in Swaziland, to provide an alternative design with Terraforce blocks. To save space for the parade grounds, the cut slopes behind the ablution block are retained with Terraforce blocks. 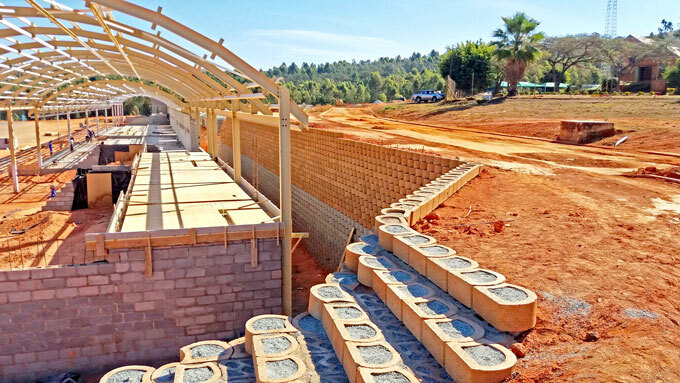 Construction on the R2.7million retaining wall contract started April 2016, and was completed in September 2016. In total two walls were installed, an 81m and 110m wall along the back and sides of the parade grounds, with a maximum wall height of 6m. The longest and highest wall was constructed with a front layer of blocks filled with reinforced concrete and Y12 rebar to the top, backed by a second, unreinforced layer 3m high only. The backfill behind each wall consists of crusher stone. At the edge of the grounds the retaining wall behind the ablution building curves around to end, following the natural contour of the site. 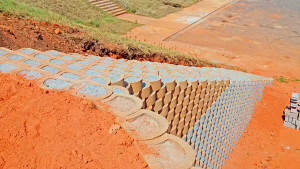 Says Toepfer: “I anticipated that the inevitable foot-traffic at that location would cause serious erosion control issues and decided to add a cost-effective stairway made entirely of Terracrete and Terraforce blocks to the design. 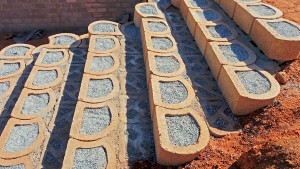 The steps start with two layers of Terraforce, stacked vertically, one below ground, one above and filled with gravel to act as a foundation.